Evelyn Glennie has been presented with few more effective-sounding vehicles for her virtuosity than this entertaining and often extremely rackety pieces... Demonstration-class recording. Gorgeous sonics top off yet another superb disc of contemporary music that we can only pray will find something like the popularity and general acceptance that it surely deserves. 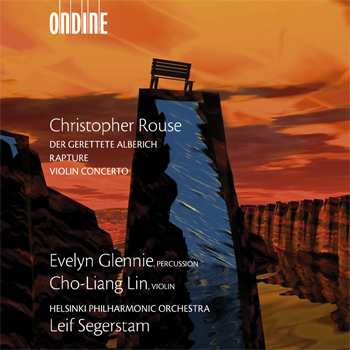 This CD contains world premiere recordings of three works by Christopher Rouse, one of America's best known and most frequently played composers (Musical America's Composer of the Year 2009). The recording features the Helsinki Philharmonic Orchestra conducted by Leif Segerstam, as well as percussionist Evelyn Glennie and violinist Cho-Liang Lin. Completed in 1997, Der gerettete Alberich was commissioned for Evelyn Glennie by a consortium of four major international orchestras. The twenty-two minute fantasy for solo percussion and orchestra postulates the return of Alberich, whose whereabouts are unknown at the end of Wagner's Ring, "so that he might wreak further havoc in what is quite literally the godless world in which Wagner has left us in the final pages of Götterdämmerung." Rapture, for orchestra, was premièred in 2000 by the Pittsburgh Symphony. The composer writes, "I wished to depict a progression to an ever more blinding ecstasy, but the entire work inhabits a world devoid of darkness - hence the almost complete lack of sustained dissonance. Rapture also is an exercise in gradually increasing tempi; it begins quite slowly but, throughout its... duration proceeds to speed up incrementally until the breakneck tempo of the final moments is reached." The featured soloist of the Violin Concerto is Cho-Liang Lin, who also premiered the piece at the Aspen Music Festival in 1992. The Baltimore Sun called the Violin Concerto, "a beautiful work, accessible yet challenging," while the Albany Times Union said it "comes close to being the best violin concerto composed in the last 25 years."